Technical detail specifications of locomotive 34007: Boiler pressure of 34007: 250 lbf/sq.in., Weight of 34007: loco 86.0 tons, tender ~42-48 tons, Wheel diameter of 34007: 3' 1'', 6' 2", 3' 1", Valve gear of 34007: Bullied chain driven, Cylinders (diameter x stroke) of 34007: 16⅜" x 24" (3), Tractive effort of 34007: 27720 lbf., BR Power classification of 34007: Class 7P. Bullied SR 4-6-2 pacific design with 'air smoothed casing, thermic syphons and Boxpox driving wheels. 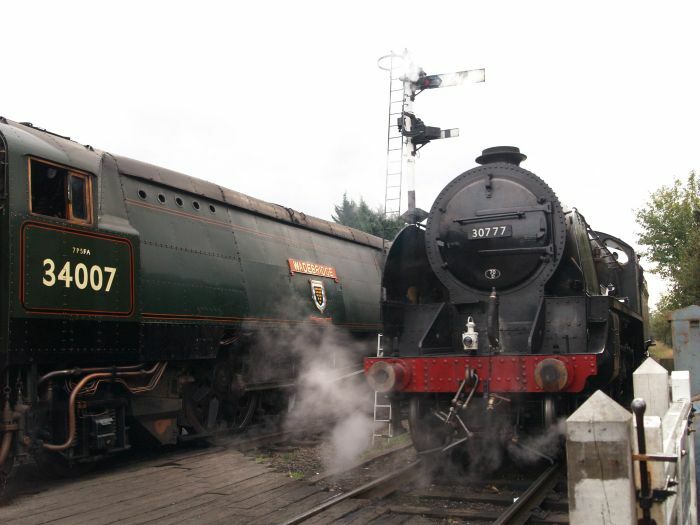 Photographed on the Great Central Railway October 16th 2011 as part of the 'Southern Railway' day when all the steam trains were hauled by West Country Class pacific locomotive 34007 WADEBRIDGE and King Arthur Class locomotive 30777 SIR LAMIEL. 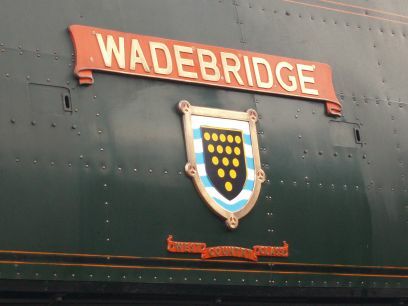 The driving cab, number and nameplate of West Country Class locomotive 34007 WADEBRIDGE. 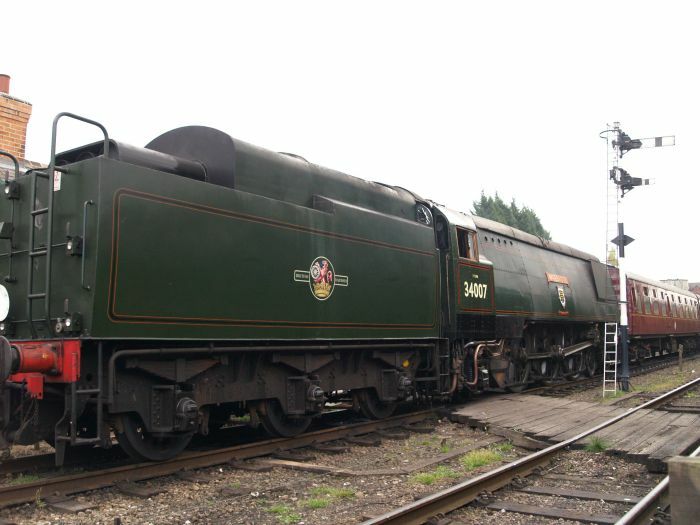 She was built at Brighton in 1945 and carried the Southern Railway number 21C107 and is preserved in good working order in the un-rebuilt form of a Battle of Britain locomotive. 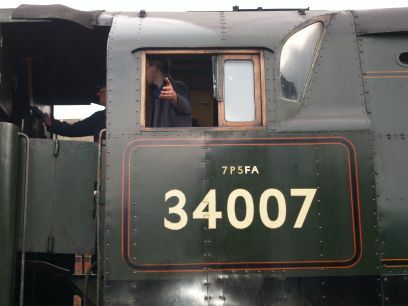 34007 WADEBRIDGE arrives at Loughborough with a GCR train from Leicester. Enter specific words e.g. locomotive, train, station, place, anything of interest!